September Starts SoCal’s ‘Winter’ Season! There’s kale and there’s kale! This truly tasty purple curly leaf kale image is by Steve! Dear Gardeners – due to being gone to see the Eclipse, I am reposting last year’s September! I’ve reread, updated and added a few items. May your SoCal Fall/Winter season get off on a terrific start! Last Harvests are being collected and stored, seeds saved! Some of you have started seedling nurseries or starts at home, many have prepped their soil and harvested seeds! If you didn’t yet, make your fall planting beds extra yummy – add 5-10% compost, 25% worm castings – seeds germinate better and do especially better with worm castings! Manure amounts depend on the type of manure. Rabbit poop manure can be used immediately with no composting! We want rich soil for those big winter plants. We want lots of those marvelous leaves for greens. Winter plants like brocs, collards, cauliflower, chard, are heavy producers, need plenty of food. Some of you carry your layout plan, design, in your head, others draw and redraw, moving things around until it settles and feels right. Do add a couple new things just for fun! Try another direction. Add some herbs or different edible flowers. Leave a little open space for surprises! Stand back, take a deep breath and ask yourself why you plant what you plant and why you plant the way you do. Anything been tickling the back of your mind you are curious about? More about Designing Your SoCal Winter Veggie Garden! Soil for your winter garden is the foundation for all your planting! See More! If you need to skip a beat, take some time off from the garden, let it rest, but let nature rebuild while it’s resting! You can cover it deeply with all the mulch materials you can lay your hands on up to 18′ deep. Believe me, it will settle quickly. Let the herds of soil organisms do their work over winter. That’s called sheet composting or composting in place, lasagna gardening – no turning or having to move it when it’s finished. If you are vermicomposting, have worms, add a few handfuls to speed up and enrich the process. Next spring you will have rich nutritious living layers of whole soil for no work at all! You can plant it with green manure. Laying on lots of mulch is a ton of work when you do it, just gathering the materials can be a challenge. Green manure takes some work too, but it has awesome results as well. You broadcast a seed mix of legumes and oats and let them grow. Bell beans, Austrian peas, vetch and oats from Island Seed & Feed Goleta is an excellent choice. Legumes gather Nitrogen from the air store it in nodules on their roots! N is the main ingredient your plants need for their growth! The oat roots break up the soil. They dig deep and open channels for water and air flow, soil organisms. It’s Brassica time! They are the mainstay of winter gardens! Their nutrition can’t be beat! Kale’s the Queen! Broccoli, Brussels sprouts, cabbages, Cauliflower and collard greens! Then there are all the mini Bs, the fillers and littles – arugula, bok choy, mizuna, kohlrabi, mustards, radish, turnips. Rather than plant just six packs of transplants, put in seed at the same time when possible and stagger your plantings of the large Brassicas. Rather than all six cauliflower coming in at once, plant two now, two later and so on. Adjust that, of course, if you have a large area available to plant and a lot of people to feed! Another way to do it is to get varieties with early, middle and late maturity dates and plant them all at once! Plant both mini and monster cabbages at the same time! Minis come in sooner, monsters later! Finicky eaters may enjoy a selection! Fall veggies come in lots of shapes and colors! Kales are renowned for their beauty and varieties – classic curly leaf, flat leaf like in the image (less aphids), Red Russian, Elephant, Red Bor that is really purple are just a few! Cauliflower comes in traditional shape and spiral, classic white and yellow and purple and green! Get seed packs of them all and mix them together! Carrots already come in color mix seed packets! Circus Circus is a fun choice, especially when your kids are planting! Beets are terrific fun! Yellows, reds, pinks, whites and Chioggias (concentric circles of colors)! You can get them in rainbow mixes just like getting rainbow chard mixes! Rather than have your finicky eater say no, open up that catalog or take them shopping a the nursery and let them pick what they would like to try! More veggies that love cooler weather are beets, carrots, celery, chard, cilantro, leeks, spinach and especially lettuce – tender butter leafs and heading lettuce! If you anticipate a hot Sep, plant more heat tolerant lettuce. The winter legume is PEAS! Peas are like beans, they come in bush and pole types. And those come in three main types – shelling, eat-them-whole snap peas and flat China/snow peas! They are super easy to sprout! Dampen the paper towel; spray the towel to keep it moist. Takes 2, 3 days. Pop them into the garden by the trellis – if it is hot, devise some shade for them. You just need to be careful as you plant them so you don’t break the sprout off. Definitely plant some every month or so. They don’t live all season long. When they are done, they’re done. It is true that picking peas, just like picking beans, is labor intensive. I eat a lot of mine before they get home, so I don’t mind. Bush peas come in first and pretty much all at once; pole come on later and continue to produce. On the first round it makes sense to plant both at once! Onions For the biggest, sweetest harvests, late summer and early fall are the prime times to sow seeds of short- or intermediate-day onions. Fall-sown short- and intermediate-day onions tend to yield more and are larger and sweeter than those seeded or transplanted in early spring. Varieties that do better in winter are long beets like Cylindras, long radishes like Daikons, pretty China Rose and handsome Long Black Spanish! Plant small beets like Dutch Baby Ball for quick beets while your Cylindras are growing twice to three times bigger! Companion planting combos make a difference! Carrots enhance peas, onions stunt peas. Plant the carrots on the sunny side feet of pole beans. Combos can use space wisely! Carrots grow down, peas grow up, perfect! Cabbage babies need to be planted 12 to 28″ apart! A healthy plant will take up much closer to that 28″. They take a long while to grow, head, head tight! Plant lettuces that repel cabbage moths, or other fillers, that mature sooner, in the space between them. You can do this at home amongst your ornamentals, and/or in containers too! Fillers can be onion/chive types, beets. Short quickest growing winter radishes can be among the long slower growing carrots among the slowest growing, your cabbages. Cilantro makes brocs grow REALLY well, bigger, fuller, greener! Research has shown there are less aphids when you plant different varieties of brocs together! No need to plant patches or rows, unless you want to. Scatter them about on the sunny side between larger plants as an understory! Plant different varieties to keep your table exciting. Don’t plant them all at once, but rather every week or two for steady table supply. If you would enjoy a quick payback for your table, select the earliest maturing varieties. If you have lots of seeds, over planting is an age old practice. Plant too, too many, then thin them with tiny pointy scissors, aka harvest the young, and eat ’em! Young radish sprouts, teeny carrots, little Brassicas of all kinds are wonderful in a salad! If they get a little big, steam them or add to stir fries and stews. Another way to do it is plant flats of lettuces, mesclun mixes, and mow them! Tender baby greens! They will grow back 3, 4 times. When planting in hot fall weather, plant your outdoor seeds a tad deeper than you would in spring; soil is moister and cooler an extra inch or two down. It’s the law to keep them moist. If you plant successively for steady fresh table supply, plant a batch in September, again in October. Days will shorten and start cooling, but you are taking advantage of a fast start because your plants will grow quickly in the warmer weather now than later on. Sep plant from seeds, Oct from transplants. Winter Feeding Lettuces like a light feed of chicken manure cultivated in. All the winter plants are heavy producers – lots of leaves, some of those leaves are monsters! Cabbages are packed tight, leaf after leaf! They may need a light feed. Remember, it’s cooler now, so their uptake is slower, so give them liquid feeds, teas, things easy for them to uptake. Keep letting your strawberry runners grow for Oct harvest. If you will be planting bareroot berries in January, remove old plants and plant green manure in October. Your green manure will take close to 2 months to maturity, Oct, Nov. Turn it under by the first week of Dec., adding acidic compost at the same time, if your soil needs it, some coir for water holding capacity. If you replace your strawberries, in Santa Barbara area try Seascape, bred at UCSB. Big fill-your-palm plentiful berries, firm, tasty, strawberry spot resistant! They have long roots that gather plenty of nutrition and stay moist at deeper levels. Available at Terra Sol Garden Center – call ahead to get the date they arrive – they go fast and then they are gone! Pest and Disease Prevention Drench young plants, ones you just transplanted, with Aspirin solution to get them off to a great start! Drench your seedlings when they get up a few inches. One regular Aspirin, 1/4 C nonfat powdered milk, 1/2 teaspoon liquid dish soap (surfactant), per gallon of water. Aspirin, triggers a defense response and stimulates growth! Powdered milk is a natural germicide and boosts the immune system. Be sure to get under the leaves too! Brassica pests! Lots of ants and lengthwise curling leaves are the giveaways for aphids. Aphids carry viruses. Aphids come in fat gray or small black. Avoid over watering that makes for soft plants, tender leaves that aphids thrive on, and ant habitat. Spray the aphids away, make the ants leave. Get up under those leaves, and fervently but carefully do the tender growth tips. Do it consistently until they don’t come back. Cinnamon is amazing. Ants don’t like it at all, and when you are starting seedlings it prevents molds and damping off. Sprinkle it on the soil in your six pack. Get it in big containers at Smart and Final. Reapply as needed. September is still Seed Saving time for some. Make notes on how your plants did, which varieties were the most successful. These seeds are adapted to you and your locality. Each year keep your best! Store your keepers in a cool dry place for next year’s plantings. Generously gather seeds for upcoming January Seed Swaps! If your area doesn’t have a seed swap, start organizing one! Borage is a beautiful cool season plant with edible flowers, blue for bees! It has a large 3 to 4′ footprint, so allow for that or plan to keep clipping it back. What flower colours do birds and bees prefer? Plant Sweet Peas for Christmas bloom! Plant gift plants or bowls or baskets for the holidays! This is a terrific time to put up a Greenhouse! You can start more seedlings, overwinter sensitive plants – eat tomatoes in December! Greenhouses can be perfect for you – the right size, easy to maintain! September gardens are a magical time of creativity and transition! See the entire September Garden Newsletter! Best Varieties of PEAS and Why! PEAS! So many to choose from! Peas are SoCal’s tasty winter legume! First decide if you want flat, snap or the peas themselves, or ALL of the above! Flat peas are called snow peas. Snap peas have a thick pod and often don’t make it home. They are eaten right when they are picked. Shelling peas have a tough thin shell, but the peas inside are delish! These might be your on-the-table steamed peas, although a fresh shelled pea is mighty tasty the moment it is shelled! Poor little helpless things. Like beans, peas come in bush and tall pole varieties! Plant bush and pole at the same time – bush come in faster, production time is shorter. When they are done, those pole peas will be right there ready for the picking next! You container gardeners will find some great dwarf varieties listed below! Mammoth Melting Sugar is a productive sweet-tasting snow pea, flat pea, ready to harvest in 68 days, resistant to Fusarium wilt. If you don’t want tall peas, there are several bush varieties to consider! Oregon Sugar Pod II has 20 to 30 inch vines, resistance to powdery mildew and Fusarium wilt, ready to harvest 65 days. Oregon Giant, growing to 30 inches tall, is resistant to most pea diseases as well. English shelling peas (bush and vine form) require more space and they have to be shelled. There are dwarf and tall varieties and those that ripen early, mid- and late-season. Dwarf vines are Little Marvel, Progress No. 9 (Laxton’s Progress) and Greater Progress. These are all resistant to Fusarium wilt. Larger vines like Freezonian are resistant to most pea diseases, including Fusarium wilt; Green Arrow, which is resistant to downy mildew, Fusarium wilt and other viruses; and Maestro, which is resistant to Mosaic virus, Fusarium wilt and other viruses. Of the Snap peas (thick edible pods) Sugar Snap is the most widely planted commercially in California. It is resistant to most diseases, grows to a height of 6 feet and is ready to harvest in about 70 days. Sugar Ann is a 15- to 24-inch dwarf that is resistant to most diseases, including powdery mildew. It is ready to harvest in ONLY 56 days! Sweet Snap (semi-dwarf), Sugar Rae (dwarf), and Sugar Daddy (stringless, dwarf) are all resistant to powdery mildew. Sugar Mel, a 2- to 3-foot tall variety, has been reported to be more heat tolerant than other sugar snaps. Plant them in February. Unlike the others, this pea needs warmer conditions to sprout successfully. It is resistant to powdery mildew and is ready to harvest in 60 to 70 days. 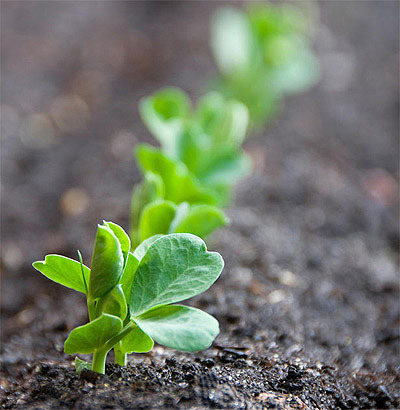 Pea Lovers, be sure to get the seeds well in advance so you will have late season peas in the spring! Notice how many of these varieties are fusarium wilt resistant! All of Santa Barbara’s Community Gardens have this wilt in the soil, so be advised! The wilts are both soil and airborne. Presprouting your peas! The main good reason to do this is you are assured of sprouts! Peas planted where there were peas before have a natural inoculant in the ground and you are likely to get peas from seeds! If you are planting where none have been growing before, you need to buy and apply some inoculant to have better success. Or, you can sprout them at home so you can plant them with no empty spaces where ones didn’t come up. Transplants are no problem. They are already up. But if you want different varieties than available as transplants, you are back to starting from seeds. Presprouting peas is super simple! Grab a plate, one piece of paper towel. Lay your towel so half of it is on the plate. Spritz it with good water, put your peas on the towel about an inch apart. Spritz them too! Fold the other half of the towel over them and spritz again. Put the plate in a warm place, not hot or in direct sunlight. Watch and wait. Keep them moist – not soaked, just moist or they may decompose/rot. Depending on temps, in about 4, 5 days you will have sprouts. Plan this ahead of time so they will be ready on the day you want to plant! Verrry gently plant them carefully, root down, so you don’t break off the sprouts. Plant them no more than a quarter inch deep, just covered. Keep your young plants consistently moist after planting. Slugs and birds. Put down Sluggo or the like BEFORE you plant tiny precious seedlings or seeds! Slugs can mow them in one night. Pea seedlings are tender and carrots are so tiny! This is a time when over planting carrots is a good strategy. Theoretically the slugs can’t eat all your carrot seedlings…. A good thick row could act as a barrier, but, you will definitely be on your hands and knees thinning those little plants for your salad! If the pellets disappear, put down some more for second generation slugs. Keep watch. Cover your seedlings with AVIARY wire as soon as your seedlings are in the ground. Birds love those fresh green morsels. A small flock of hungry winter birds can take the whole lot in moments. Once the plants are up, 8″ to a foot, you can try removing the wire. In our garden the birds still peck the leaves of the bigger plants, so my enclosure is about 1 1/2′ tall on both sides of the trellis. Harvest tips! Once picked, peas lose their sugar within hours, so pick, shell and eat them as soon as possible. No problem. Pick peas regularly to extend your harvest. Be careful – use two hands to pick the peas, one to hold the stem, the other to pick the pod. There is nothing so sad as to pull a producing vine from the ground accidentally. You can’t replant them. And that’s why you stake your trellis or cage so strongly to prevent them from blowing over in winter winds! Don’t lag getting your trellis up or installing your cage. Peas grow quickly, and keeping them off the ground keeps them out of reach of ground feeding insects, soil diseases, and gives a clean harvest. Plant lots of them, different kinds, successively, every month or two! When I first started gardening veggies, a gardener said to me ‘You can never plant enough peas!‘ As a pea lover, I now know he was so right! May your peas live long and prosper! Some Surprising Tips on How to Grow A Profusion of Glorious Sweet Peppers! Peppers with 3 bumps on the bottom are sweeter and better for eating. Peppers with 4 bumps on the bottom are firmer and better for cooking. Do you think that is true? Sweet Peppers like: Basil, Tomato, rhubarb, eggplant, Lettuce, Asparagus, Parsley, Silver Beet, Spinach, carrot, onion, beans, cabbage, peas, marigold and okra. Hot Pepper plants do well alongside Eggplant, Tomato, Okra, Swiss Chard, Escarole, Squash and cucumbers. Soil Peppers need VERY RICH SOIL, are heavy feeders! Place compost, worm castings, rotted manure under them when transplanting. Mix in 1 T Epsom Salts, Maxi Crop, Landscape Mix. Sandy soils are preferred for the earliest plantings because they warm more rapidly in the spring. Heavier soils can be quite productive, provided they are well drained and irrigated with care. Epsom Salts! A cheap home remedy that can keep plants greener and bushier, enhance production of healthier fruit later in the season, and potentially help reduce blossom-end rot. Apply 1 tablespoon of granules around each transplant, but research has shown a foliar spray of a solution of 1 tablespoon Epsom salts per gallon of water at transplanting, first flowering, and fruit set is more effective! As a foliar spray, Epsom salts can be taken up quickly by plants, otherwise, it is sometimes hard for the plant to get it out of the soil because of calcium competition. The easy way to foliar feed is to have a watering can whose nozzle swivels so the spray can go UP, wetting the undersides of the leaves. What goes through and above the leaves as you spray, comes down on the top of the leaves you are spraying, doing both top and bottom at once! Peppers love sun, but a bit of shade is good for the fruit. Last year I planted a Poblano between two big tomato plants. For awhile I thought it was a goner, shaded out, then, it just grew and grew! It got almost 4′ tall and produced like crazy and I gave giant peppers away! Plant your peppers about a foot to 1 1/2 feet apart. A healthy pepper will get big, and it is wise to put small tomato cages over thick wall bell pepper varieties when you plant, to support the weight when they are heavy with fruit. Too cool weather, nighttime temps 55 F or below for a time, may cause the blossoms of transplants to drop off. The only solution is to make sure night temperatures have warmed sufficiently before transplanting peppers outdoors. The plants will survive and more blossoms will appear. When daytime temps reach 90 F and above, and stay there, just like with tomatoes, the blossoms seldom set fruit. Not to worry. Just give them some time. Personal Mulch! Solanaceae, that’s peppers, tomatoes, eggplants, like mulch from their own leaf litter, so just let the leaves fall and accumulate. Harvest! 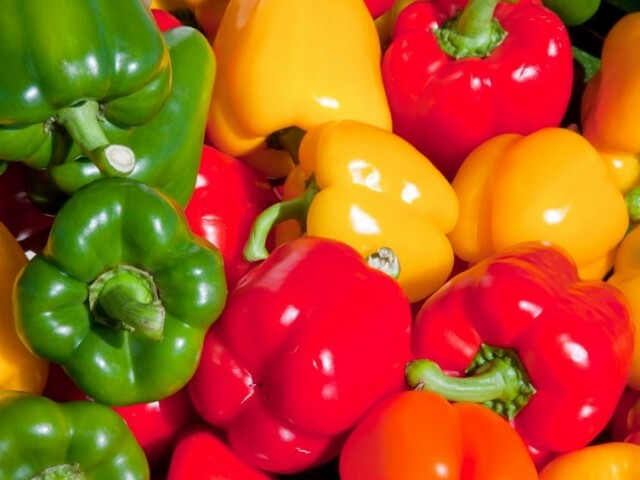 Bell peppers are at their sweetest and are highest in Vitamins A and C when fully mature. When choosing bell peppers for eating, select those that are firm, heavy for their size with shiny, richly colored skin. The bell pepper’s sweetness increases as their color changes from green to their final color. SEEDS! Harvest mature, fully-ripe peppers for seed. Most bell peppers turn red when fully mature. If frost threatens before peppers mature, pull entire plant and hang in cool, dry location until peppers mature. There are two methods, dry and wet, to process pepper seeds. The dry method is adequate for small amounts. Cut the bottom off the fruit and carefully reach in to strip the seeds surrounding central cone. In many cases, seeds need no further cleaning. May your peppers be fat and plentiful! Midday, on a hot day, watering will burn the leaves. Evening watering promotes mildew, fungus growth. Plants drink during the day, so AM watering is best. Tomatoes in soil with Fusarium and Verticillium Wilt fungi in the soil. Fungi don’t do well in dry soil. Celery and chard, lettuce, arugula – leaf crops, to keep them growing fast, tender and tasting sweet. Planted seeds, seedlings, newly planted transplants, must be kept moist; if they dry, they die. Put up temporary shade. Use a watering can for seeds and tender seedlings so seeds aren’t washed away or seedlings broken. Most plants need only an inch of water once a week unless it is hot and/or windy weather. Most gardeners over water by two times as much as is needed! Overwatering drowns plants, and kills micro soil organisms; they don’t get oxygen. Soil structure is destroyed as air spaces cave in. Overwatering also causes poor root growth making it difficult to move enough water to the leaves during hot weather. Fuzzy plants like tomatoes, eggplant, don’t do well with watering on their leaves. Water underneath please. Plants that are mulched generally need less water. Poke your finger in the soil to see how deeply it is moist. More on mulching next week. Tomatoes: stop watering when about a foot tall. Water around them, but not right at them. Keep back about a 2’ perimeter to reduce Fusarium and Verticillium Wilt fungi. If you do water them, on mature plants, cut off the lower leaves, up to 18” high, to prevent soil splash when watering. The fungi are especially taken up by leaves touching the ground. Flush off aphids and the undersides of broccoli leaves and broc side shoots, kale leaves, especially the curly varieties. Healthy Summer Feeding, Watering, Disease & Pest Prevention! Feeding. It’s heating up, your plants are growing fast, they’re hungry and need more water! Give your leaf crops like lettuce lots of Nitrogen. Don’t overfeed beans, strawberries or tomatoes or you will get lots of leaf, no crop! 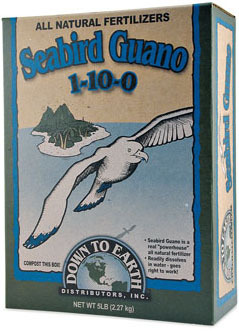 If you do, did, give your plants some seabird guano (bat guano is too hot sometimes). Fertilizers high in P Phosphorus bring blooms – more blooms = more fruit! Get it in bulk at Island Seed & Feed. It’s easy to apply, just sprinkle, rough up your soil surface, water in. Go lightly with your applications to young plants that could get burned. When blooming starts, give your plants phosphorus fertilizers once a week, a month, as the package says, as you feel, to keep the blooms coming! Foliar feed your peppers, solanaceaes – toms, eggplant, and your roses with Epsom Salts! Only 1 Tablespoon per gallon of water does the job! Water deeply. Poke your finger down into the soil to see how deeply your watering has penetrated. Get one of those gurgler devices to keep the water from blasting a hole in your soil; put the hose under your veggies. Try to remember to keep moving it. That’s the main reason I don’t do that myself, I just get carried away with weeding or tending, or harvesting, chatting, and, uh oh, woops, forget, and it’s flood time. Maybe I’ll carry a pocket sized timer and experiment with the right timing per water flow? Still, it’s a nuisance to have to keep moving the durn thing. The advantage of standing there watering is you notice what’s happening in your garden and think on what to do next. Flooding isn’t good because it drowns your soil organisms, and your plants drown too, not able to get their oxygen quota. What’s weird is that some wilting plants, like chard, may not be needing water at all! Some plants just naturally wilt in midday heat. They are doing a naturely thing, their version of shutting down unneeded systems, and watering them isn’t what they need at all! Also, flooding kinda compacts your soil as the life is washed down the drain so to speak, natural healthy soil oxygen channels cave in. You see, it’s the balance you need. Water underneath rather than overhead to keep from spreading diseases like strawberry leaf spot. Harvest first while bean plants are dry so you don’t spread mildew, then water. Wash your hands if you handle diseased plants, before you move on to other plants. Ok, May is one of our mildew months. Get out the nonfat powered milk, throw some in your planting hole. Drench your plantlets, especially beans, melons and zucchini, while they are small, maybe every couple of weeks after that with ¼ Cup milk/Tablespoon baking soda mix, to a watering can of water. Get it up under the leaves as well as on top. That gives their immune system a boost, makes unhappy habitat for the fungi. Spray off black and gray aphids, white flies – get up underneath broccoli leaves, in the curls of kale leaves. Spray the heads of broc side shoots, fava flower heads. Remove badly infested parts or plants. NO ANTS. Leafminers – remove blotched areas of the leaf or remove infested leaves from chard, beets. Don’t let your plants touch each other. Except for corn that needs to be planted closely to pollinate, plant randomly, biodiversely, rather than in blocks or rows. If you are planting a six-pack, split it up, 3 and 3, or 2, 3, 1, in separate places in your garden. Then if you get disease or pests in one group, they don’t get all your plants! Crunch those orange and black shield bugs, and green and black cucumber beetles (in cucumber & zuch flowers). Sorry little guys. Plant year round habitat for beneficial insects, pollinators – lacewings, ladybird beetles, hover flies. Let some arugula, broccoli, carrot, cilantro, mustards, parsley go to flower. Plant Borage. Bees love its beautiful edible blue star flowers, and they are lovely tossed on top of a cold crisp summer salad! Love your Garden, it will love you back!